This 15 inch MacBook Pro Retina Display is badly cracked. There are visible crack marks across the display and blue, white, green, and purple vertical lines going up and down over the screen. The image on the screen is also jittery and shaky, causing the photo here to be a bit blurry. 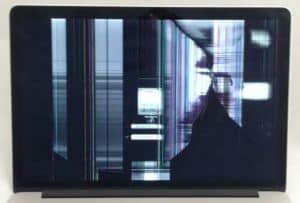 These are some of the possible signs of a broken LCD panel. Sometimes, the glass on the front of the screen will remain intact, but in this case there is also a scratch on the surface of the screen where the impact was. Our repair service fixes all of these issues. On this A1398 model, we replace the entire display assembly, meaning the whole “lid” portion of the laptop, with a brand new piece. This will fix broken glass, broken screen, lines, splotches, shaky image, dents on the corners or back of the display, and even a broken webcam. The repair can be done in under 24 hours.